The six pavilions of the East are the pendant of the six pavilions of the West, symmetry obliges. They were also devoted to the habitat of empresses and concubines. The six courts are carefully arranged, arranged on the east side of the three main halls of the inner courtyard. Each palace has two courtyards, a courtyard reserved for receptions and the other for private apartments, and is surrounded by high walls. Each palace has 22 rooms and 2 wells. These pavilions are visitable, they contain nowadays showrooms for some collections, in addition to containing furniture and other objects of time. The palace of great brilliance is the pavilion where Emperor KangXi was born, second emperor of the Qing dynasty who knew how to be accepted by his people, although of foreign origin (He was Manchu, like his father) and thus allowed to his dynasty to remain on the throne for almost three centuries. The palace of the prolonged conheur was rebuilt relatively recently, in 1931, to serve as cellar. 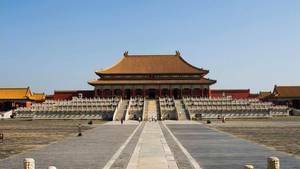 It is the only modern reinforced concrete building in the Forbidden City. Lovers of calligraphy will appreciate the works exhibited here. This pavilion also exhibits many old ceramic pieces. The palace of eternal grace was both Dong Xiao'e's harem and a beloved concubine of Emperor Shunzhi (the first emperor of the Qing Dynasty). This palace is now a showroom for a large number of bronze pieces. Finally, the Palace of Eternal Harmony exhibits pieces of the life of imperial concubines during the Qing Dynasty, while in the Palace of Great Shine and Purity accumulated enamelled objects and delicate jade products are visible to the visitors.